I looked in front 'n there was a small TV. The driver had put on the Doordarshan channel. My wife 'n I looked at each other with disbelief 'n amusement. In front of me was a small first-aid box with cotton, dettol 'n some medicines. This was enough for me to realize that I was in a special vehicle. - from Islam 'n Christianity to Buddhism, Hinduism 'n Sikhism. There were also pictures of the heroes of 26/11- Kamte, Salaskar, Karkare 'n Unnikrishnan. I realized that not only my vehicle, but also my driver was special. I started chatting with him 'n the initial sense of ridicule 'n disbelief gradually diminished. I gathered that he had been driving an auto rickshaw for the past 8-9 years; he had lost his job when his employer's plastic company was shut down. He had two school-going children, 'n he drove from 8 in the morning till 10 at night. No break unless he was unwell. "Sahab, ghar mein baith ke T.V dekh kar kya faida? Do paisa income karega toh future mein kaam aayega." We realized that we had come across a man who represents Mumbai – the spirit of work, the spirit of travel 'n the spirit of excelling in life. I asked him whether he does anything else as I figured that he did not have too much spare time. He said that he goes to an old age home for women in Andheri once a week or whenever he has some extra income, where he donates tooth brushes, toothpastes, soap, hair oil, 'n other items of daily use. 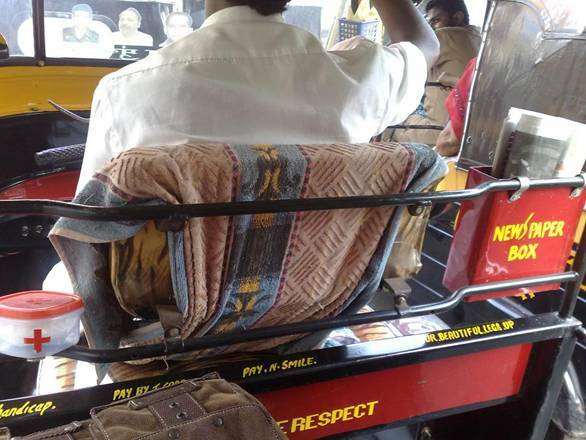 He pointed out to a painted message below the meter that read: "25 per cent discount on metered fare for the handicapped. Free rides for blind passengers up to Rs. 50. My wife 'n I were struck with awe. The man was a HERO! A hero who deserves all our respect!!! 45 minutes of a lesson in humility, selflessness, 'n of a hero-worshipping Mumbai, my temporary home. free ride for a blind man. I hope, one day, you too have a chance to meet Mr Sandeep Bachhe in his auto rickshaw: MH-02-Z-8508. Be a Reason for Million Smiles…. But Never be a reason for even a single Grudge…..